How can the idea of “We the people” help us understand the history of the early United States? The story of the founding years of the United States is often told from the perspective of the elite political leaders who crafted the country’s founding documents. While these individuals played major roles in the early history of the United States, the contributions and experiences of other important groups and individuals are often overlooked. A New Nation engages students with this range of experiences, asking students to consider the opportunities, hardships, aspirations, and questions facing people across society in the early years of the new nation. A New Nation covers the early decades of the United States, from 1783 to 1830. Part I traces the founding years of the nation, from the end of the American Revolution through the end of the eighteenth century. Part II examines political, social, and economic transformations that took place as the United States expanded during the first two decades of the nineteenth century. Part III continues to chart changes that shaped the nation through 1830, from industrialization to controversies over slavery and westward expansion. Students identify geographical landmarks in the eastern third of the United States and examine U.S. government documents as well as statements by native people about land treaties from the 1780s. Students analyze historical documents from the 1787 Constitutional Convention and trace the debate that took place at the convention over the international slave trade. After reading excerpts from the Declaration of Independence, U.S. Constitution, and U.S. Bill of Rights, students collaborate to identify key principles in these documents and consider the importance of founding documents to a nation’s history. Students analyze and map demographic and economic data to explore the relationship between the expansion of slavery and the cotton boom in the early United States. Using excerpts from first person slave narratives, students learn about “invisible” churches and understand their role in enslaved people’s resistance to slavery. Using primary sources, students analyze how marginalized groups have used the ideals found in U.S. founding documents in order to demand rights. Student identify the value and limitations of using different types of sources to draw conclusions about the significance of the Haitian Revolution to the United States. They integrate their findings into a coherent written response. To be used in the Options Role Play. 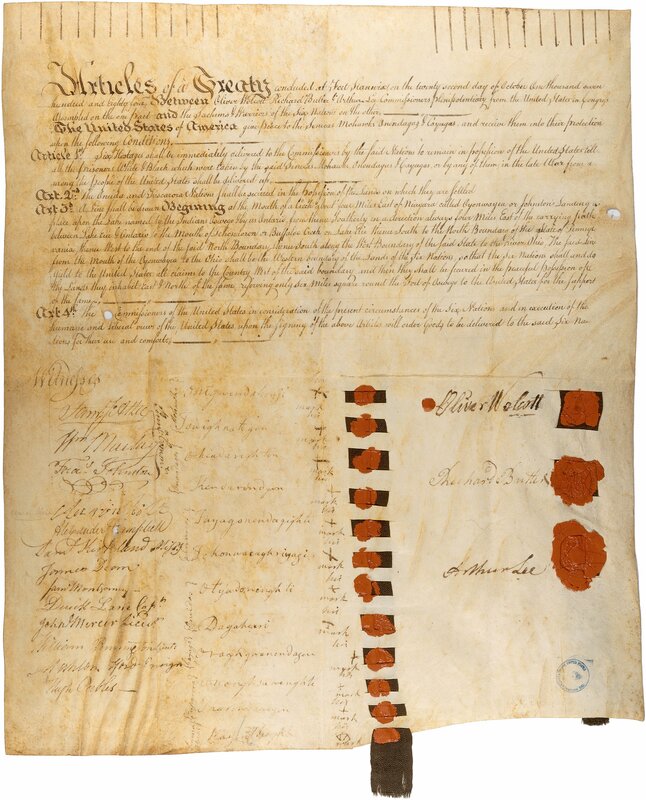 To be used in the lesson “The Geography of Expansion and Dispossession.” This document is an optional source that could be added to the source set on the Treaty at Fort McIntosh. Appleby, Joyce. Inheriting the Revolution the First Generation of Americans. Belknap Press, 2001. Calloway, Colin G. The World Turned Upside Down: Indian Voices From Early America. Boston: St. Martin’s Press, 1994. Camp, Stephanie. Closer to Freedom: Enslaved Women and Everyday Resistance in the Plantation South. Chapel Hill, NC: University of North Carolina Press, 2004. Dooley, Patricia. The Early Republic: Primary Documents on Events from 1799-1820. Westport, CT: Greenwood Press, 2004. Egerton, Douglas R, Alison Games, Jane G. Landers, Kris Lane, and Donald R. Wright. The Atlantic World: A History, 1400-1888. Wheeling, IL: Harlan Davidson, 2007. Grant, Susan-Mary. A Concise History of the United States. Cambridge: Cambridge University Press, 2012. Johnson, Walter. River of Dark Dreams. Cambridge, MA: Harvard University Press, 2013. Lewis, Jan. The Revolution of 1800: Democracy, Race, and the New Republic. Charlottesville, VA: University of Virginia Press, 2002. Miles, Tiya. The Dawn of Detroit: A Chronicle of Slavery and Freedom in the City of the Straits. New York: The New Press, 2017. Nielsen, Kim E. A Disability History of the United States. Boston: Beacon Press, 2012. Taylor, Alan. The Civil War of 1812: American Citizens, British Subjects, Irish Revels, & Indian Allies. New York: Alfred A. Knopf, 2010. Online access to thousands of primary legal and diplomatic documents throughout U.S. history. Online platform with curated collections of primary sources, lesson plans, and activities about many topics in U.S. history. A website with primary source collections about the history of the U.S. South. Extensive online collections with primary sources that cover various topics in U.S. history. Search the Smithsonian database for viewing primary sources on early U.S. history from all of the Smithsonian Museums. A database and other resources with information about the transatlantic slave trade. Students read excerpts from the U.S. Declaration of Independence, Constitution, and Bill of Rights and consider the importance of founding documents to a nation’s history.